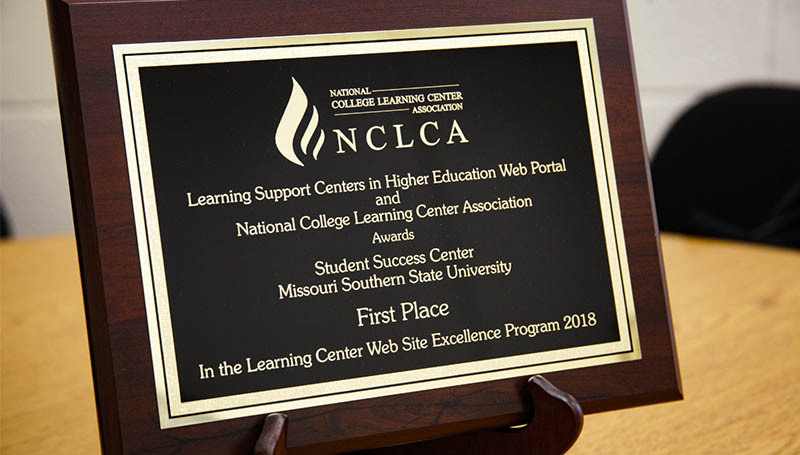 The Student Success Center at Missouri Southern has received national recognition for its website. Stephanie Hopkins, the center’s director, and academic skills specialist Craig Thompson attended the National College Learning Center Association’s annual conference in Niagara Falls, N.Y., to receive the first place Website Excellence Award. In conjunction with Learning Support Centers in Higher Education (LSCHE), the award recognizes websites that incorporate best practices and content judged to be most helpful to students seeking learning support. “We received second place back in 2015, so we had a good base,” says Hopkins. “Each year, the NCLCA and LSCHE establish standards for best practices. We took that spreadsheet and used it to build on what we already had. The Student Success Center worked closely with Megan Vest, a web developer in University Relations & Marketing, to update the site. After submission, the judging panel reviewed pages and selected Missouri Southern as 2018’s first place winner. “We’re very proud of this,” says Hopkins. The center received a plaque, which is on display in the center on the third floor of Hearnes Hall.